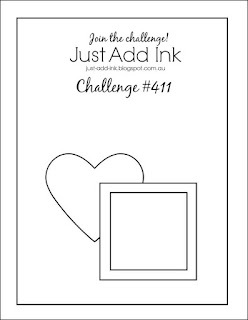 Welcome back to another Just Add Ink Challenge. This week Jan is challenging us to Just Add a sketch. The great thing about sketches is that you can use them as is or tweak them a touch as I have done with my card. I simply rotated the sketch to change the position of the heart.... and changed the shape. Okay so I guess I tweaked it quite a bit! I just went with the shape from the stamped image. I was itching to use some of my new products - which you can order from today! 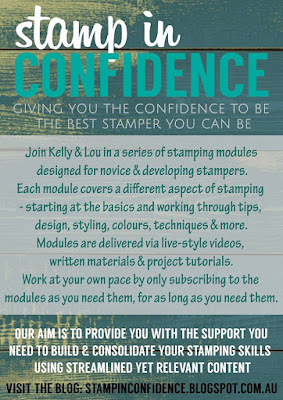 The 2018/19 Annual Stampin' Up! Catalogue is now live. Yay! I was really excited to use this gorgeous Accented Blooms stamp set and some of the fabulous new colours. Check out these beauties! These fabulous new colours made it so easy to watercolour the blooms using an aqua painter and ink from the lids of the ink pads. Have you seen the design of the new ink pads yet? You will love them! There are some great little images in this stamp set too. 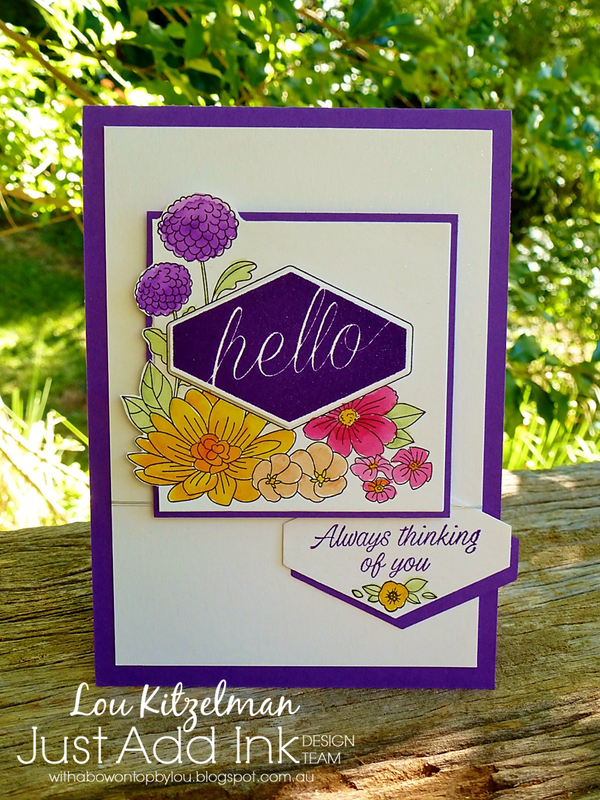 I love how the flower fitted in the point of the punched shape and under the sentiment. I am not really a purple person but I love how bright Gorgeous Grape is. Makes a nice change for me! I love how this stamp set coordinates with the Tailored Tag punch. 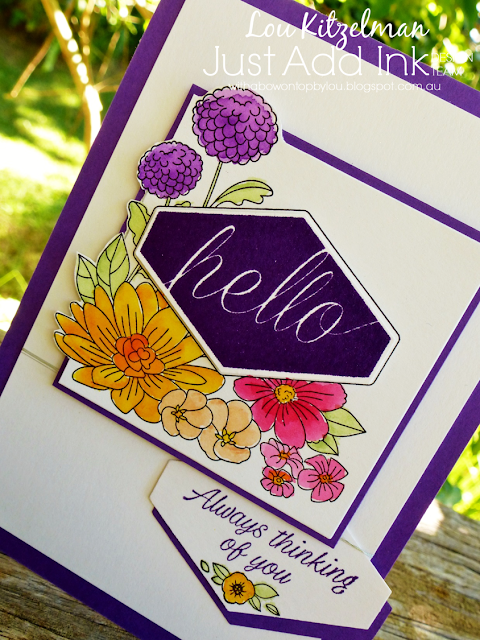 I simply punched the 'hello' and raised with stampin' dimensionals. Adds a touch of drama in a flash. 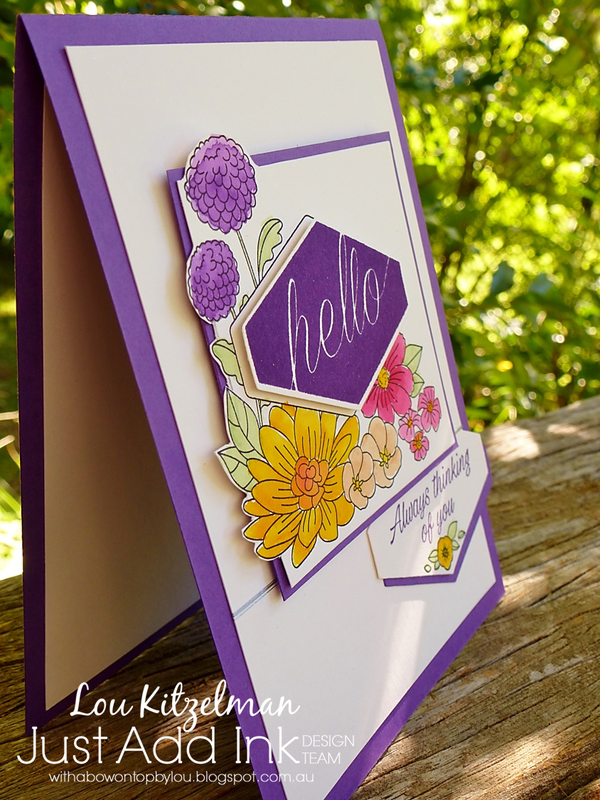 Make sure you pop on over to the Just Add Ink page to see how all the other Design Team members used this sketch. Why not enter your own creation? We always love seeing them!